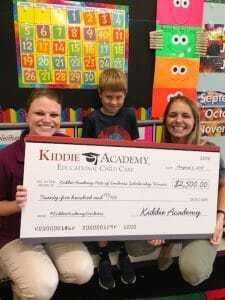 To celebrate our achievement of enrolling 25,000 students across our national network of 208 Academies, Kiddie Academy® recently awarded $25,000 in Academy tuition scholarships across 10 locations throughout the U.S. With kindness being a cornerstone of our Life Essentials® curriculum, we challenged our nationwide network of Academies to participate in an “Acts of Kindness” campaign, where students and families participated in and chronicled their own kind acts for a full week in July in an effort to be named one of 10 scholarship recipients. Created with the goal to inspire Kiddie Academy students to perform acts of kindness toward their classmates, family, friends and community, the Acts of Kindness campaign resulted in hundreds of social posts including photos and videos that embodied the theme of kindness and consideration to others. To share in this effort and celebrate kindness at the corporate level, 40 employees including Helwig and several members of the executive team from the Kiddie Academy headquarters in Abingdon, MD, participated in a community service day to benefit the Harford Family House (HFH), a nonprofit organization that provides transitional housing for homeless families with children and unaccompanied adults ages 18 to 24. We’re so proud of our students, teachers and employees who demonstrated kindness, and we look forward to seeing it continue all year long! What are little random acts of kindness you and your family do to spread joy?